Note: We are greatly indebted to many brethren in Canada, U.S.A. and overseas for the information which appears in the Tidings section each month. We deeply appreciate their kind help and assistance. As a guide to all who submit obituaries, the optimum length for an obituary is 70 to 100 words. Longerobituaries must be edited due to space limitations. Our deadline is the 6th of the previous month. There are months when all our allotted space is filled prior to the deadline, so to ensure inclusion of your news items, please forward as soon as possible. Terrace, A week’s ministry in April by Noel Burden on assembly truth was much appreciated. Vancouver, In early May, Jim Allen had nine nights of profitable ministry at West Richmond. In mid May, Sandy Higgins had a series at Victoria Drive on Marriage and the Family. The ministry was greatly appreciated by believers in the area with visitors coming from as far away as Seattle. On May 30, a young lady was baptized at South Main, and Bryan Funston was with them for this happy occasion. The monthly ministry meeting on June 6 was in the Fairview assembly with Jim Currie and Tom McNeill sharing the ministry. Believers from various assemblies planned a gospel effort at the Chinatown Market in Vancouver’s Chinatown on Friday, Saturday and Lord’s day evenings throughout the month of June. Calgary, Well over 200 saints gathered for the annual conference over the Victoria Day weekend. Helpful ministry was given by B. Funston, G. Goff, S. Kember, F. Krauss, W. McVey, J. Ronald Jr., C. Van de Wetering and G. Williams. Prior to the conference, Jim Allen was with the assembly for one night of ministry. Edmonton, The saints appreciated visits in May by Jim Allen, Noel Burden and Fred Krauss. Fort McMurray, On May 18, the saints were greatly encouraged by timely ministry by Jim Allen and Bryan Funston. Grande Prairie, A visit by Jim Allen on May 16 and 17 was a great encouragement to the new assembly. A number of new people attended the Monday evening meeting. Lethbridge, Steve Kember and Shad Sluiter planned to start gospel meetings in June. Taylorside, The saints enjoyed a recent visit from Fred Krauss. Swan River, Jack Gould and Bruce Smith (Glen Ewen) expect to use the tent for gospel work in this area in July. Arnstein, The believers were cheered by a visit from Arnold Gratton on May 24. Clinton, In late April, the assembly was encouraged by visits from Arnold Gratton and Tom McNeill. On May 12, Leslie Wells gave timely ministry and an interesting report of gospel labours in Northern New Brunswick and Eastern Quebec. Combined children’s meetings and gospel meetings are purposed to commence in August in a tent at nearby Vanastra. Deer Lake, On April 25, the assembly had a good visit from Larry Steers. London, More than 100 believers, who were very appreciative to hear preaching in their mother tongue, gathered with unsaved friends and relatives on May 29 and 30 for the Spanish conference. E. Doherty, R. Hanna, S. Kember Jr., W. McBride, D. Rodgers and C. Vasquez, visiting from Chile, shared in ministry and gospel. prevailed. The Midland assembly is planning tent meetings to begin on August 8 with Mr. Paisley and help from local brethren. Mr. Paisley also planned to give help in Parry Sound and Orillia in July. Oil Springs, Prayer is valued for tent meetings which William Metcalf and Bert Snippe expect to commence in August. Sarnia, The new hall was completely filled for the conference in May. Strongville, Prayer is requested for tent meetings which Brian Crawford and Clarence Black plan to start in the Minesing area on July 26. Toronto, The Victoria Park assembly had its first baptism on June 6. Larry Buote visited several assemblies in the area in early June. Wallaceburg, William Metcalf and Bert Snippe planned tent meetings starting in late June. Windsor, The first week of June was the fifth week of gospel meetings by William Metcalf and Bert Snippe. There has been an excellent interest from outsiders and several men and some young people have professed to be saved. Longueuil, Larry Buote and Leslie Wells held two weeks of gospel meetings but the response from the area was disappointing. A special Seed Sowers distribution is planned for the last week of July. Following this effort, Larry Buote and Shawn St. Clair (Ottawa) expect to start gospel meetings. Atholville, On May 24, Leslie Wells and Grard Roy commenced gospel meetings in a rented building with an encouraging attendance of unsaved. Green River, More than 200 attended the conference in early May. The believers were encouraged by the ministry and the Bible readings on the two aspects of the Lord’s coming. The Breaking of Bread was outstanding. New Denmark, Prayer is requested for gospel meetings which Allan LeBlanc and Lorne Langfeld expect to commence on July 19. Pigeon Hill, Gerard Roy and Ivan Poirier held gospel meetings with a few strangers coming and one lady showing excellent interest. Saint John West, Murray McCandless and Darris Barney expect to commence a series in the gospel on July 7. Shdiac, At last report, local brethren were in their fifth week in the gospel with blessing in salvation. Barrington Passage, Prayer is requested as Albert Hull and James McClelland plan to return again for tent meetings commencing July 5. Cornwallis (Clementsvale), Stephen Vance and David McClelland expected to commence tent meetings on June 27. Sydney Mines, At the opening of the new hall on June 5, a number of town officials were present for lunch, and a good number of local outsiders were present for an afternoon ministry meeting and an evening gospel meeting and baptism, when a sister obeyed the Lord in the waters of baptism. The day went so well, they continued into Lord’s day with another large afternoon meeting. Present to help were: W. Bingham, M. McCandless, P. Orasuk, P. Ramsay and K. Taylor. Previously, the saints enjoyed a visit from Fred Bartlett on May 16. Corner Brook, Lord willing, the gospel will be proclaimed from an open air trailer in various locations on the West coast this summer. This is the first summer for this type of effort in these parts although some assemblies have had local open air meetings. Gander Bay, The saints were encouraged at the annual conference held on May 21-23. Rocky Harbour, The assembly appreciated a gospel series with David Hunt and David Swan. Old contacts were renewed and new ones were made. St. John’s, Ministry meetings by Robert McIlwaine were well attended and profitable. East Los Angeles, The Spanish speaking assembly celebrated its second annual conference on March 27 and 28 with about 250 in attendance. Francisco Sagaztume (Guatemala), Edward Doherty, Tom Baker and Harrys Rodriguez gave excellent ministry. Prior to the conference, brother Sagaztume had a week of ministry and following the conference, brother Rodriguez also had a week’s ministry. Turlock, Three weeks of tent meetings by David Oliver and Joel Portman concluded on May 25. Attendance was very encouraging with 60 visitors from the area coming to hear the gospel. On May 16, three believers who were saved previously, were baptized. Sunnyslope, A young lad brought up in the Sunday School, who moved away with his family, was saved at home. He returned to the meetings and was baptized on May 5, with his entire family present. Prayer is requested for this family; the grandfather died in late May. Rapid City, Allan Christopherson planned to have gospel meetings in July helped by local brethren from Iowa. Burwell, On June 6, Roy Weber and Joel Portman started tent meetings. Arlington, Robert Orr and Allan Christopherson began tent meetings on June 6. Parkersburg, Prayer is requested for gospel meetings which Eric McCullough and William Bingham plan to begin in a tent east of Parkersburg on July 11. Alpena, A man who professed earlier this year was baptized on June 6, encouraging the saints. Brodhead, In late May, Robert Orr was with the saints for several days. New Lenox, On May 8 and 9, the ministry and gospel preaching at the conference were with power from God. A young woman professed to be saved during one of the gospel meetings. Cass City, William Laveny and Jack Nesbitt expected to start gospel meetings in a tent six miles north of here on June 20. Saginaw, Ministry by William Metcalf and Dan Shutt encouraged the saints in Saginaw and surrounding assemblies at the all day meeting on June 6. Akron, At the beginning of May, the assembly appreciated ministry and a report on the work in Japan from Jim Curie. Mansfield, Please pray for gospel meetings planned to begin on July 11 with Larry Steers and Robert Surgenor. New Creek, The saints appreciated James Smith’s visit and ministry on May 12 and 13. Cumberland, James Smith conducted ministry meetings on the Tabernacle from May 5-11. Frostburg, The saints were cheered at the annual conference by ministry from W. Gustafson, W. Lavery, E. McCullough, W. Seale, J. Smith and D. Vitale. Matoaca, In mid May, Jim Currie visited and encouraged the believers. Just prior to the Hickory conference, Murray McCandless and Arthur Ward gave appreciated ministry. 30, N. Crawford, W. Lavery, M. McCandless, E. McCullough, D. Oliver and A. Wand ministered and preached the gospel. The hall was well filled and there was a sense of God’s presence in every meeting. Prayer is requested for our esteemed brother Oswald MacLeod who is showing some recovery from his recent stroke. Tampa, The assembly appreciated visits for six consecutive weeks in April and May by James Paterson and John MacDonald from Scotland. The ministry was practical and encouraging. Also, practical ministry was given by Jim Flanigan of Ireland. Bryn Mawr, Jim Cunrie gave enjoyable ministry at Pennsauken, (May 6 and 7) Barrington (May 9), Hatboro (May 10 and 11) and Bryn Mawr (May 12). The believers appreciated having Arthur Ward for Lord’s day, May 23. Hatboro, On June 6, Albert Hull and David Oliver commenced tent meetings. Livingston, Speakers at the annual conference were: J. Currie, W. Gustafson, M. McCandless, W. Oliver, W. Seale, D. Vitale and A. Wand. The saints appreciated the support expressed in the attendance and the visits of those who spoke. Brother Gustafson expected to have ministry meetings in mid June on assembly truths. Longport, Two and a half weeks of gospel meetings by Gene Higgins and D. Draper (Pennsauken) were a great encouragement to the residents of the Home. The assembly was encouraged by the number of unsaved who came. Midland Park, The saints appreciated ministry by Jim Currie on May 4 and 5, and by Gene Higgins on May 6. Manchester, James Smith began gospel meetings on May 30 and was encouraged at the beginning of the meetings. Byfield, The conference attendance increased and the ministry by L. Buote, W. Gustafson, E. Higgins, Bryan Joyce, K. Taylor and F. Tonnaquindici was enjoyable and helpful. Saugus, The spirit of the annual Bible readings on I John was excellent. The saints received profit and the teaching was practical. Watertown, On May 23, the assembly held its first “Gospel Dinner” since the building renovations. James Smith preached the gospel and five strangers were in attendance as a result of personal invitations and distribution of 1,000 Seed Sowers. Brother Smith remained through the week taking up the Tabernacle furniture with the use of charts. The ministry was helpful and appreciated. Worcester, The saints appreciated a visit by Larry Buote for three nights at the end of May and also by Ken Taylor on June 1. Hardwick, Ernest Green (France) paid an appreciated visit. Bangor, Helped by brethren from the Augusta assembly, Bryan Joyce began gospel meetings on June 7. Belfast, In the Windsor hall, J. Hutchinson and A. Aiken have been getting fairly good numbers as they preach the gospel nightly. Cardy, S. Ferguson and W. Boyd planned to start in the gospel in early June. Castlewellan, Good numbers are attending a gospel series by J. Palmer (Crossgar) and R. Shannon (Kilkeel). Magherafelt, Three local brethren are preaching the gospel in a portable hall about seven miles from the town in a very difficult and neglected area. Newry, At last report, A. McShane and D. Gilliland were in their fifth week in this border town. Whitehouse, Robin McKeown and B. Graham continue in the gospel. Conferences, During May, conferences were held at Drumlough and Ballymacashon. July 30, 31 and August 1 in Highway Gospel Hall, 2549 Hebert Rd. Saturday morning Bible reading on Revelation 22. Corn. 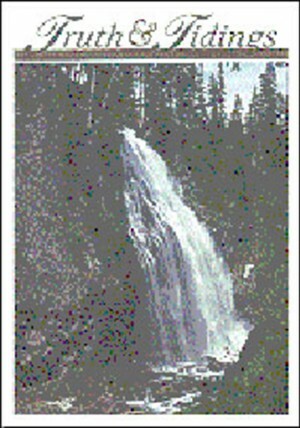 Glenn A. Griffin, 3344 Elliott Rd., Westbank, BC, V4T 1P2, (250) 768-3343. September18 and 19 in the Gospel Hall, with prayer meeting on Friday at 7:30 p.m. On Saturday, Bible reading at 8:45 and Ministry at 10,2:30 and 7:30. Breaking of Bread at 10. Supper served at 5 p.m. on Friday. Corn. Don Brunne, Arnstein, ON, POR lAO, (705) 757-2030. September 4 and 5 in the Gospel Hall, commencing with Prayer and Ministry on Saturday at 10a.m. Bible reading on Lord’s day at 8:30 a.m. on Hebrews 10:1-25. Breaking of Bread at 10. Corn. Lionel Cress, RR 1, Clementsvale, NS, BOS iGO, (902) 467-3115. Accom: James McClelland, (902) 467-3351. September 4 and 5 in Copley High School, 3797 Ridgewood Rd., Copley. On Saturday, Ministry at 10, with Bible reading at 1:30 on The Christian Mind. Breaking of Bread at 10. Prayer meeting on Friday at 7:30 p.m. in the Gospel Hall, 2705 Smith Road, (330) 867-3818. Accom: David Metcalf, 3228 Blake Road, Wadsworth, OH 44281, (330) 334-9691 . Corr. Kenneth Webb, P0 Box 13350, Akron, OH 44334, (330) 666-9466. August 21 and 22 in the Gospel Hall, 3006 Elyria Ave. On Saturday, Ministry at 10 and 2 with Gospel at 7. On Lord’s day, Breaking of Bread at 9:15, SS & Ministry at 11:15, Ministry at 2 and Gospel at 7. Corr. Randall H. Bradford, 1875 E. 34th St., Lorain, OH 44055, (440) 277-5461. Iris Lenore Aronson of Hardwick, VT, age 86. Our dear sister was born on June 14, 1912 in Shortham, VT and was saved on April 4, 1926 at the Manchester, CT conference in Cheney Hall listening to the late John Ferguson preaching the gospel. Ephesians 2:8,9 were the verses that helped her find salvation. She was in fellowship in Hartford, CT and then Manchester, CT. In 1954, she moved to Vermont and was in fellowship in the Woodbury (later Hardwick) assembly She cared for many elderly and sick believers, including her mother, Mrs. Ed (Nina) Corliss. Cora Pamer of Akron, Ohio, age 93. Our dear sister and her husband Peter were brought into contact with the gospel about 1931, and she was saved through the truth of John 3:16. Their home was always open for the gospel and for the believers. She continued faithfully until her homecall. Mrs. Pamen is survived by two children, both saved by the grace of God. The gospel and words of comfort were spoken to a large number of relatives at the funeral by Murray Metcalf and Kenneth Webb. Connie Harold of Akron, Ohio. Our dean sister was first contacted with the gospel through children’s work in 1965. She was saved while attending tent meetings conducted by Harold Paisley and Bill Snyder in Twinsburg in 1974. Shortly afterwards, she was baptized and received into assembly fellowship. The gospel was presented to many relatives at the funeral service. Mary (Mrs. Elwyn) Magee of Matoaca, Virginia in January, age 86. Our beloved sister was saved as a young girl. She and her husband, who went home to heaven in 1985, had a deep affection for the assembly. In recent years, she suffered the effects of advancing years but retained her cheerful and gentle disposition. Her sister, Margaret Leys, who had lovingly cared for her, predeceased her by two weeks. She leaves a number of grandchildren and great-grandchildren who need salvation. Mrs. Dorothy Fuller of Vancouver, BC on April 15, age 89. Our dear sister passed into the presence of her Lord on her 89th birthday. She bone a faithful and consistent testimony to the end, always encouraging others. Mrs. Fuller was predeceased by hen two husbands, Tom King and Bill Fuller, and is survived by her sister Helen, brother Ernest and eight stepchildren. She will be dearly missed by all who knew her. Emery V. Richards of Hatboro, PA on May 9, age 97. Our dear brother was saved on February 16, 1918 at the age of 16 through the truth of John 3:16. He was a highly esteemed and beloved elder in the Hatboro assembly for many years and was gracious, patient and hospitable. Brother Richards was part of the group that formed the first assembly in that town, and often engaged in gospel work in the local area. Many missionaries and preachers stayed with the Richards when visiting the Hatboro area. He went to heaven from the Longport Home. Betty Macfarlane of Glen Ewen, SK on May 10, age 58, after a courageous struggle with cancer. Our dear sister was saved on March 27, 1958 and was a quiet, consistent and godly person. Betty was a true helpmeet for her husband Don as together they cared for the assembly, lovingly opening their home to all who passed their way. Besides hen husband, Betty leaves to mourn hen passing, two sons, one daughter, three grandchildren, four sisters and one brother. At her funeral, words of comfort and solemn gospel warnings were given by L. Steers and B. Smith. Rocco Cornacchia of Toronto, Ontario on May 13, age 69. Our dean brother was saved in 1969 as a result of receiving a gospel tract. He was in fellowship in Highfield, Fairbank and Broadview assemblies until ill health prevented his attendance. Jack Yocum and Don Jennings spoke faithful words at his funeral. Please pray for the salvation of his family. Miss Ethel Birley of Unionville, Ontario on June 1, age 94. Our dear sister was saved as a young lady while Robert Telfer was speaking at Broadview on the Great White Throne from the Two Roads chart. She was baptized and received into the Broadview assembly. Shortly after, she moved to the Pape Avenue assembly where she was in fellowship for many years. She attended all the meetings very faithfully In hen early days, she was active in the Sunday School and she continued to be active in the Sewing Class until going to Bethany Lodge in 1990.